Almost two weeks after Superstorm Sandy slammed the East Coast, Massachusetts fuel distributor Dennis K. Burke, Inc. continues sending fuel and resources to assist in FEMA relief efforts in the storm devastated areas of New York and New Jersey. Adding insult to injury, a second major storm brought whipping winds and record snowfalls, hampering utility workers and adding another 200,000 to the 550,000 homes left without power. Initially, Burke started sending fuel trucks to support the utility trucks traveling to some of the worst hit areas of New York. Two days after the storm, Burke sent five more trailers of fuel to join the caravans of utility trucks heading towards New York. Just as the fuel distributor’s trucks were arriving in New York, FEMA officials were asking Burke if they could help by bringing in fuel for the army of emergency vehicles that were brought in to help with the recovery. The fuel dealer has been sending several trucks to New York and New Jersey every day since. Burke has decades of working with utility companies in rough weather. During bad storms, the fuel company often sends trucks to fuel the utility trucks and tree-cutter’s trucks while they’re parked and out of service. The company also offers its customers an emergency generator program, where they check the generator’s fuel status and guaranteeing emergency fuel deliveries in the New England area. 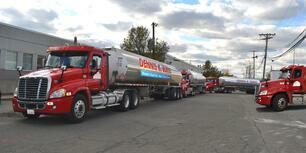 Dennis K. Burke, Inc. is one of New England’s leading suppliers of diesel fuel, gasoline and motor oil products. Burke supplies fuel customers in ten states, with terminal positions in eight states, across the Northeast and Mid-Atlantic region.